I held off decorating the nursery and buying anything until I was about 32 weeks. This was due to a few reasons – I had accepted a promotion at work in September and work was snowing me under, I was a bit superstitious about not tempting anything by starting to prepare early and there was a slight bit of denial as well! What was the first item I bought? Well, walking around Tesco mid October, the Christmas stock was starting to be put out and something truly hideous caught my eye. A Christmas elf baby outfit complete with red and white striped hat. My due date was 15th December so I could picture it now, little one snuggled under the Christmas tree with the ridiculous outfit on after we had all just enjoyed a huge Christmas dinner and maybe even a glass of Prosecco in hand. It was the first time I had been able to picture little one with us so I took it as a sign and bought the outfit. The 25th of December arrives, and I am round my parents unable to get comfortable at the dinner table, baby enjoying sitting, rolling and generally hammering all my vital organs whilst I was desperately hoping he would hold off for another day or two. I sold that outfit six months later at a baby sale with tens of other of items. All the other items I had either bought for me by friends who weren’t Mums yet, well-meaning colleagues or clothes which had been worn three or four times at the most. The friends who are Mums are the ones who have bought the 9-12 month outfits and sleepsuits which I discovered a pile of the other day and did a little jig at their thoughtfulness. So, if I could talk to the me of 12 months ago, here’s the advice I would give. Unless baby was going to be really small (projected weight of 8′ 2″ from scans…so no! ), buy first clothes in 0-3 months. Newborn stuff is pointless. A couple of outfits but really not many. To be honest, you are so scared you are going to pull their arms out of their sockets dressing them that sleepsuits were the outfit of choice for the first couple of weeks! My Mum wanted to take me clothes shopping for the baby so we trotted around Mothercare because I assumed that’s where everyone gets their baby clothes from. No! I should have gone to Next! Next for us early 30s women is a bit of a transition between Topshop/New Look but before M&S I always feel…but their baby clothes are OUTSTANDING! Well priced, look the bomb and so many different choices for girls and boys. Something to sleep in downstairs. My one never got to grips with his moses basket. A later blog will reveal what I chose for him to sleep in. It may surprise you! Wipes! We started off with Water Wipes as recommended by so many friends and then switched to good old Aldi for 55p a pack when he was three months old. I would do the same thing now if I were to have another one. Nappies – don’t buy too many of the smallest size. They are not in size 1 or 2 for very long. Size 3 for longer and then size 4 for a good few months. An electric breast pump if breast feeding works out for you and you wish to express. Don’t do a manual. Just don’t. Bottles – 6 bottles saw us through the daily cycle. Started with Avent bottles but switched to Tommee Tippee as little one preferred the teat. A bottle sterilizer. I picked a microwave one up from an NCT sale for £3. And buy a bottle brush. An emergency dummy. You might swear blind you are never going to use one. We did. That changed one night when he was 11 days old we had taken it in 45 minute cycles of sitting up through the night with a screaming child. My husband drove to a 24 hour Tesco at 4am in the morning. It worked. A pram and for goodness sake make sure it’s got a decent, deep basket underneath! Moses baskets in the bedroom and C-sections are not a good combination. Child cries, it takes you more time that you think you lift yourself us, go and get him and lift the child over the basket. We ended up buying a second hand Next to Me Chicco bed to have by the side of ours. Both of us agree, it was our best purchase in the first few months. Tommee Tippee Perfect Prep machine. Yep, you can do it the old fashioned way of boiling a kettle, letting it cool and then making up the mixture but a perfect temperature bottle in less than 2 minutes. Yes please. A car seat. Don’t be afraid to get them to show you multiple times how to fit it in your car. They wouldn’t let me drive away from Halfords until they were confident I could safely buckle it in. A nappy bag you don’t mind carting around for months. It will replace your handbag so make sure you are happy with it! Nail clippers. Their nails grow faster than Wolverine’s! At the baby sale, when my little boy was 6 months old, I sold so many either unnecessary items and some unwanted. Cuddly toys, newborn and 0-3 month clothes, manual breast pump, baby books that I hadn’t read, photo frames, black and white baby books, pram sensory attachments, hooded blankets, lots of other blankets people had bought for me, bouncers for the door frame, slings that I bought and not fallen in love with, baby photo albums and log books. So, so, so much stuff. And what did I do with the £100 I made? 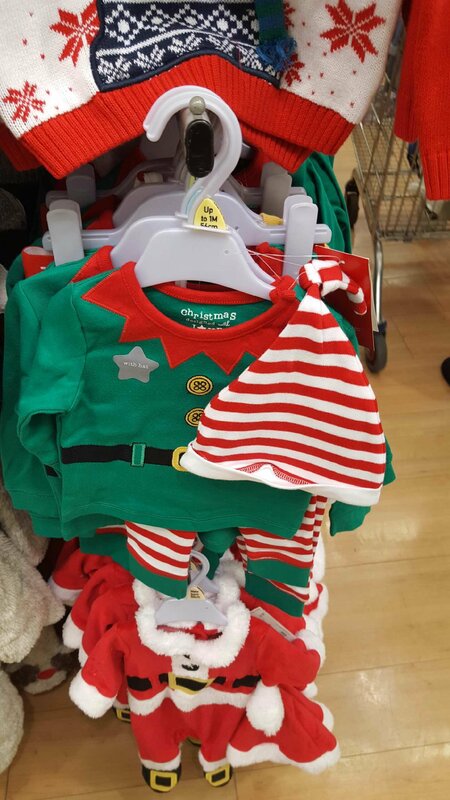 I bought my little man some 6-9 month clothes and you’ll be pleased to know that it was not a novelty elf outfit….maybe a pumpkin outfit for Halloween.